One or more photo(s) has been virtually staged. 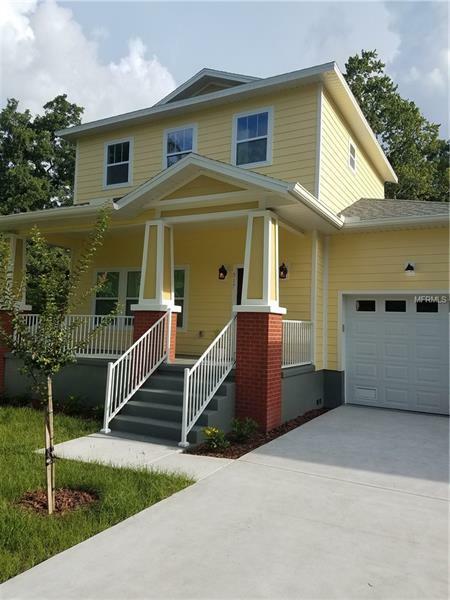 Absolutely georgeus craftsman new construction house in the heart of Seminole Heights located just few houses from Hillsborough River! The property is unique borders the undeveloped properties to the west of the subject! One of the quality completed product by Seminole Heights builder specializing in Historic Craftsman Style of Houses. The home features hardie board siding, hurricane impact windows, a covered and screened in back porch, crown moulding- gracing 10' high ceiling and 3/4" tongue in groove high quality Bellawood hardwood floors.The spacious kitchen is fit for the whole family to enjoy with an open floor plan; it is equipped with quartz countertops, a breakfast bar, stainless steel appliances, wood cabinetry and it's own pantry. Two large bedrooms, bath with subway tile, laundry room and half bath complete the downstairs layout. Upstairs you will discover your master suite features walk in closet with built in wooden cabinetry. The second floor has its own central zoned air conditioning; targeting maximum comfort! The master bathroom has double vanity custom sinks, a divine freestanding tub and oversized walk in shower. The fourth bedroom upstairs can be utilized as an office/study. Your luxurious brand new house is located 2 miles from downtown and it's walking distance to many restaurants and parks located along the Hillsborough River. Call now!